A team led by the Department of Energy’s Oak Ridge National Laboratory has uncovered how certain soil microbes cope in a phosphorus-poor environment to survive in a tropical ecosystem. Their novel approach could be applied in other ecosystems to study various nutrient limitations and inform agriculture and terrestrial biosphere modeling. Phosphorus is a critical nutrient for global biological processes, such as collecting the sun’s energy during photosynthesis and degrading plant debris and soil organic matter. 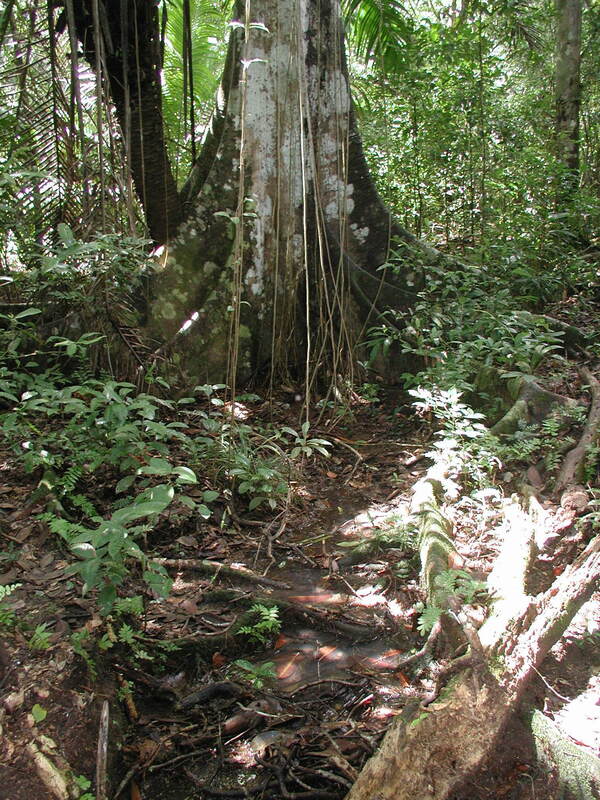 Most tropical ecosystems endure long-term weathering that leaches phosphorus from soil. Soil scientists from Oak Ridge National Laboratory uncovered how certain microbes cope in a phosphorus-poor environment to survive in a tropical ecosystem. Credit: Melanie Mayes/Oak Ridge National Laboratory, U.S. Dept. of Energy (hi-res image)They collected soil samples at the Smithsonian Tropical Research Institute in the Republic of Panama, an experimental field site with phosphorus-rich plots and unfertilized control plots. “Finding so many genes to break apart and transport such a complex molecule tells us that microbes are hungry for phosphorus in untreated soil,” said Melanie Mayes, an ORNL senior staff scientist who studies multi-scale environmental processes. Conversely, she noted that when phosphorus was plentiful, more genes needed to acquire complex carbon compounds were present. “The microbial community prioritizes the breakdown of the most needed nutrients, focusing efforts on the most limiting element to balance their overall nutritional needs,” she said. The team ran each soil sample through a series of rigorous and comprehensive analyses. The DOE Joint Genome Institute conducted deep sequencing of the soils’ metagenomes, or genetic material recovered directly from the soil. ORNL then used mass spectrometry and metaproteomics to identify more than 7,000 proteins in each sample. ORNL’s Titan supercomputer quickly analyzed the large amounts of metagenomics and metaproteomics data, comparing microbial activities in phosphorus-rich and -poor soils. Environmental Molecular Sciences Laboratory scientists further characterized the soils’ organic matter at Pacific Northwest National Laboratory. Results from their three-year study titled, “Community Proteogenomics Reveals the Systemic Impact of Phosphorus Availability on Microbial Functions in Tropical Soil,” were published in Nature Ecology & Evolution. The paper’s coauthors included Qiuming Yao, Zhou Li, Yang Song, Melanie A. Mayes and Chongle Pan of ORNL; S. Joseph Wright and Benjamin L. Turner of the Smithsonian Tropical Research Institute; Terry C. Hazen, University of Tennessee-ORNL Governor’s Chair for Environmental Biotechnology; Xuan Guo of UT; Susannah G. Tringe of the DOE Joint Genome Institute; and Malak M. Tfaily and Ljiljana Paša-Tolic of Pacific Northwest National Laboratory. The research was supported by the Laboratory Directed Research and Development program at ORNL. Metagenomic sequencing was conducted by the DOE Joint Genome Institute and soil organic matter analyses were performed using Fourier-transform ion cyclotron resonance mass spectrometry by PNNL’s Environmental Molecular Sciences Laboratory, both DOE Office of Science User Facilities. This work also leveraged the Oak Ridge Leadership Computing Facility, a DOE Office of Science User Facility.